From the implementation of GDPR (General Data Protection Regulation) in the European Union to stirring a wave of data protection and data localisation across the globe, there were various initiatives aimed at strengthening individual data at many levels. While data privacy was a hotly debated topic on one end, there were other developments also brewing around AI, automation, robotics and more, shaping and strengthening various avenues of work and industries. India also frenetic VC activity with investments flowing into AI space. 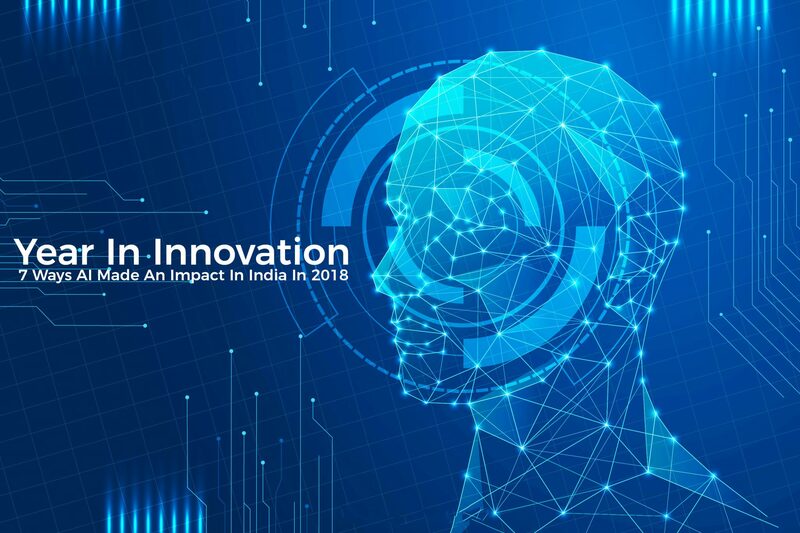 While there were a lot of investments and partnerships, upskilling and product launches, the year 2018 witnessed a lot of innovations in the AI space in India. With a slew of innovations, it is quite likely that India will remain at the forefront of AI innovations in the coming year too. India witnessed an extensive use of AI in healthcare, especially in areas such as diagnosis and radiology. It was especially seen in the area of cancer detection with startups such as Niramai making waves, Qure.ai that leverage AI and deep learning for radiology. These AI-based products can identify common abnormalities in the body quicker than the conventional methods. There were also developments in AI-based x-rays that is gaining traction. In areas such as fintech, entertainment and airlines, there was extensive adoption of AI-based chatbots and robots in these areas. While Bengaluru airport unveiled Kempa, the humanoid robot to help passengers, VISTARA launched a unique AI-based robot called RADA that will grace Delhi airport. Fintech, banks and pharmaceutical companies were among the few industries to embrace chatbots. For instance, AI chatbot Mattu & Mittu by Muthoot Group made a debut as new customer assistants to explain financial portfolio, noted pharma company Lupin launched a new chatbot called ANYA whereas SBI Mutual Funds launched their first AI-based voice assistant in collaboration with Google. In fact, the railway also adopted AI a big way this year. Whether it was the robot USTAAD, chatbot Ask Disha or adoption of emotional intelligence, chatbots ruled in 2018. Facial recognition was the talk of the town, whether its increased adoption in various fields of work or the controversy around it as it grew racist. India saw startup such as FaceX which in less than 10 months of being formed were able to achieve a facial recognition accuracy of more than 94%. Paytm had also introduced facial recognition technology to enable digital payments. India also saw a surge in interesting startups in the areas of emotional intelligence, Habitual AI and more, areas that had not been explored to its full potential before. A startup launched its unique AI product called Habitual AI that automates the process of building habits, enabling banks to create habitual users across digital and mobile platforms. There are many startups in India who are revolutionising the space. Also, research by IIIT Delhi suggested that India could soon have a driverless rickshaw. It was reported that the Indraprastha Institute of Information Technology (IIIT) in Delhi is working on a driverless autonomous electric rickshaw to provide last-mile connectivity to urban Indians. Narendra Modi-led government had been working to make autonomous vehicles a reality. President Ram Nath Kovind had said that “strong bond” was crucial between agriculture and technology. PM Modi had also said that the future of agriculture lay in AI and blockchain technology. 2018 was about dealing with fakes using AI. While India saw startups such as MetaFact that rely big time on AI to deal with it, social media giants such as Twitter and Facebook made an initiative to deal with fake new during elections. Spotting fake news and videos was one of the top research agendas by leading tech giants like Facebook, Twitter and Google. From fake news to deepfakes, artificial intelligence enterprises and researchers doubled down on tackling fake news, images and videos phenomena.